At Elder Advisers we work tirelessly to help families financially plan for their loved one’s transition to an assisted living facility or nursing home. Did you know, every day, someone’s spouse, parent, sibling, grandparent, friend or neighbor is unnecessarily spending their hard-earned money on a nursing home stay or forced to spend down their assets to qualify for Medicaid? Do not let this happen to your family. You have options. Let Elder Advisers help! We want to ensure you too “Don’t Go Broke in a Nursing Home.” Call us today at (800) 763-7930, or visit our “Contact Us” page, for more information. For over twenty years, Larry Weiss has been helping families in Southern Indiana and Kentucky financially plan for the future. Through personal, one-on-one meetings, Larry and the dedicated Elder Advisers team offer clients peace of mind knowing decades’ worth of hard work and savings are protected for years to come. Since 1996, Larry has been a member of the Louisville chapter of the Better Business Bureau (BBB), the same year he formed Larry G. Weiss, Inc. In addition to the BBB, Larry is a member of One Southern Indiana, the Chamber of Commerce for Southern Indiana, the Shelby County Chamber of Commerce, the Greater Louisville Aging in Place Alliance and is a certified estate planner with the National Institute of Certified Estate Planners. Larry and his family are lifelong residents of New Albany and members of St. Paul’s Church. An active member of the community, Larry enjoys giving back to the place he is proud to call “home.” In fact, Elder Advisers has been long-time sponsor of the Power of Pink Gala, and Larry remains highly active with the Floyd County Animal Rescue League. In year’s past, Larry has served on the New Albany Redevelopment Authority Planning Commission’s Board of Zoning Appeals and with Boy Scout Troop 15. 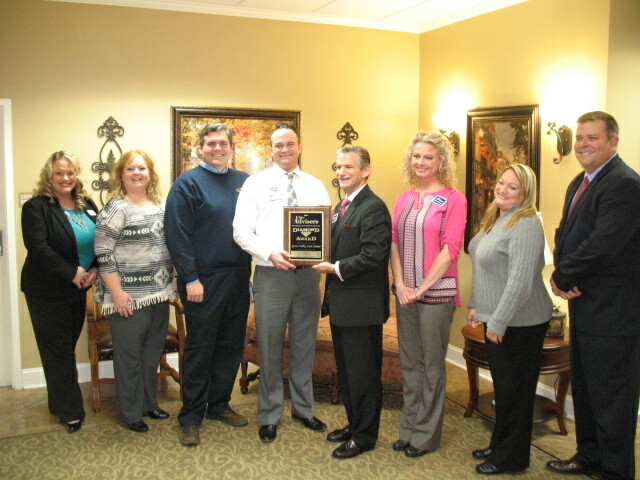 Tim Goebel of Elder Advisers presenting the Gold Award for Excellence with the staff of New Albany Health & Rehab. 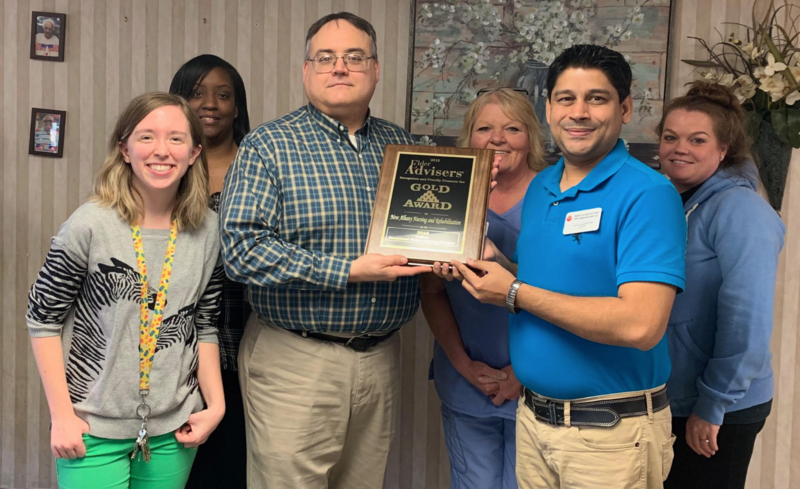 Elder Advisers presenting the Gold Award for Excellence to Park Terrace Health and Rehab Center. The staff of Elder Advisers along with Remax Realtor, Fancy Fulton join host John Ramsey on Wave 3 Listens Live. 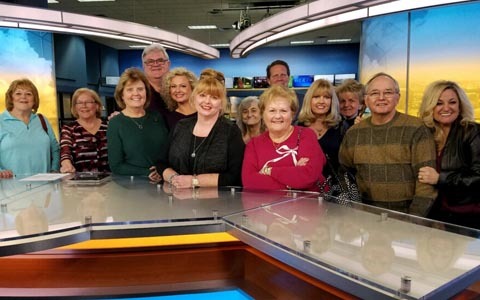 Elder Advisers was honored to host the entire episode. 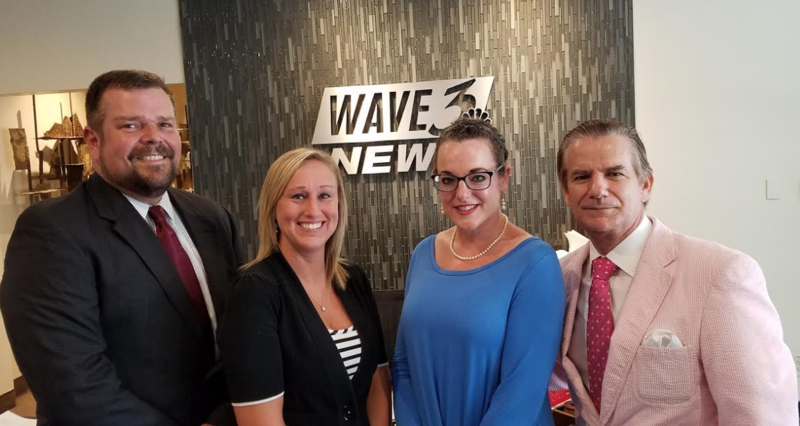 Steve Langdon, Autumn Schneider, Jennifer Grooms, Larry Weiss at the television studios of WAVE 3 News. 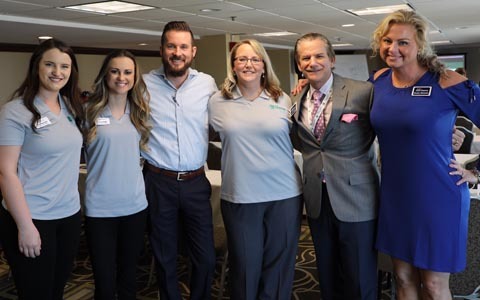 Larry Weiss and Denise Manecke had a great time and learned new strategies to help Kentuckiana families at the Krause Financial Services Medicaid Planning Academy in Memphis, Tennessee. Larry was honored to take part as a presenter on the second day of the seminar. Denise Manecke joins just a few of the Elder Advisers’ friends and family while shooting their newest commercial. Larry Weiss and his team visiting with the great people of Unity Financial at their headquarters in Cincinnati, Ohio. 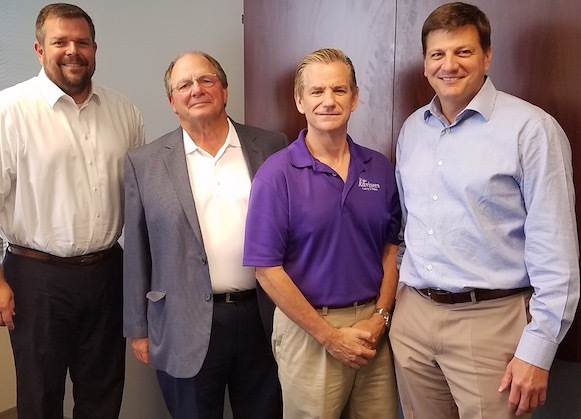 Pictured left to right are Elder law attorney Stephen P Langdon, Hoosier Senior Solutions President Kevin Wedmore, Elder Advisers President Larry G Weiss and Unity Financial President Jay Hardy. This is the Elder Advisers Gold Award for Excellence that was given to New Albany Nursing and Rehabilitation today. 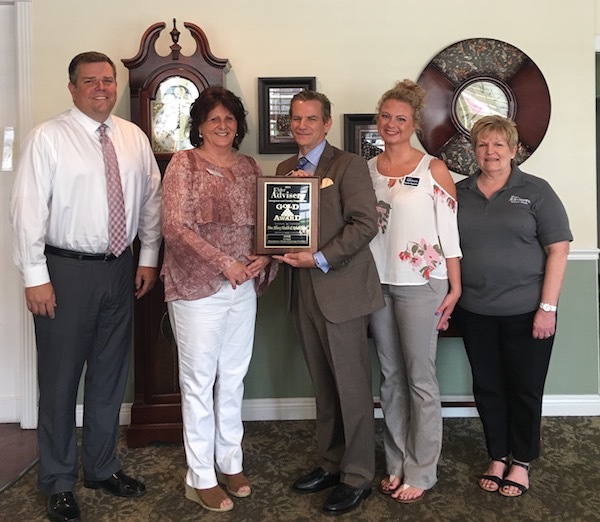 Pictured left to right are: McNeely Stephenson Elder law attorney Stephen Langdon, Facility Executive Director Blossom Bach, President Larry Weiss, Executive Vice President Denise Manecke and Office Manager Susanne House. 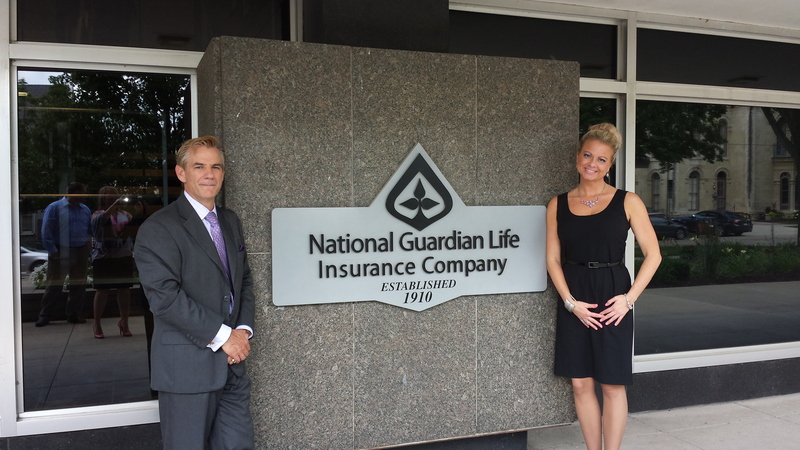 The Elder Advisers’ team visited the staff of National Guardian Life Insurance company in Madison Wisconsin. NGL is a valuable resource to our families and helps offer solutions to protect assets otherwise lost on nursing home care. 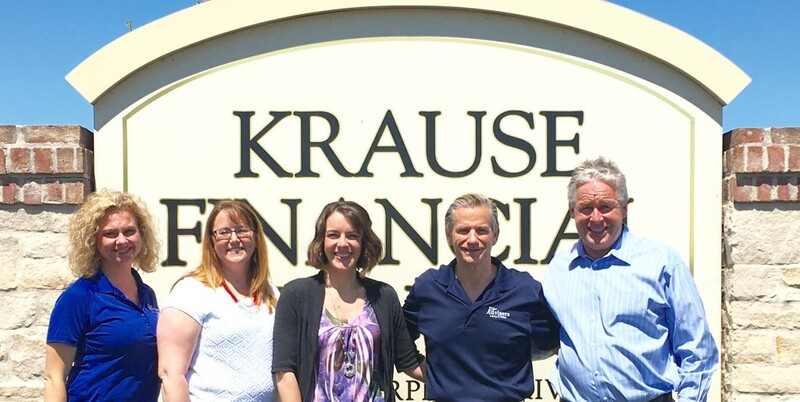 Larry Weiss and Denise Manecke visited Krause Financial in De Pere, Wisconsin. Dale Krause and his staff are a valued resource, as well as experts in Medicaid and VA benefit planning. 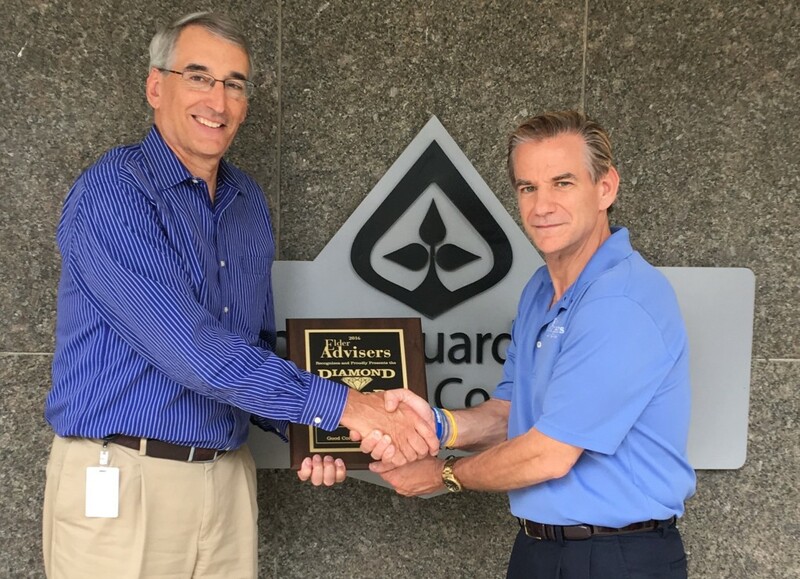 Larry Weiss presents Carl Wakerle of National Guardian Life with the 2016 Good Corporate Neighbor award. 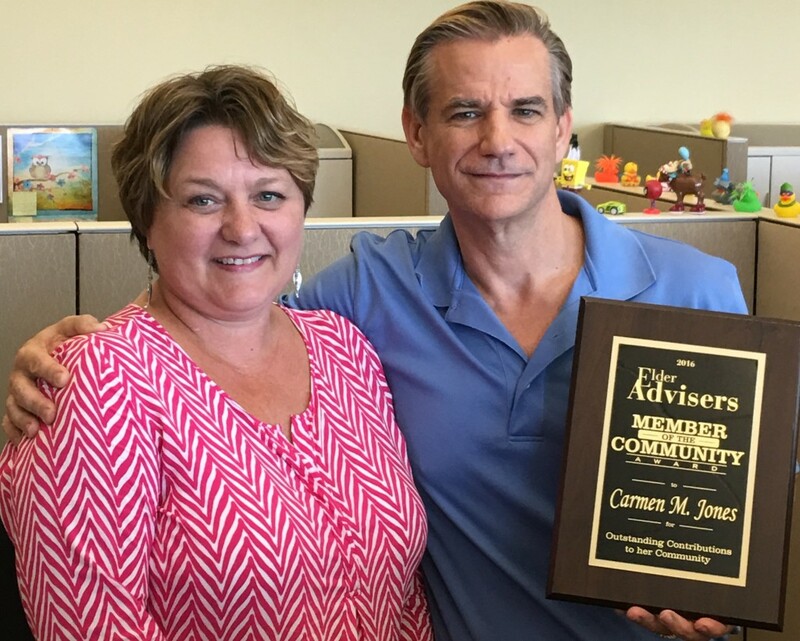 Larry Weiss presents National Guardian Life’s Carmen Jones with the Elder Adviser’s Member of the Community Award. We awarded Essex Nursing and Rehabilitation the 2015 Diamond Award for Exceptionally Skilled Nursing Facility. Essex staff works day and night to ensure the highest level of care for each and every one of their residents. In addition to the Diamond Award, the facility also received a special proclamation recognizing their service and commitment to our community by Metro Council President David Yates. 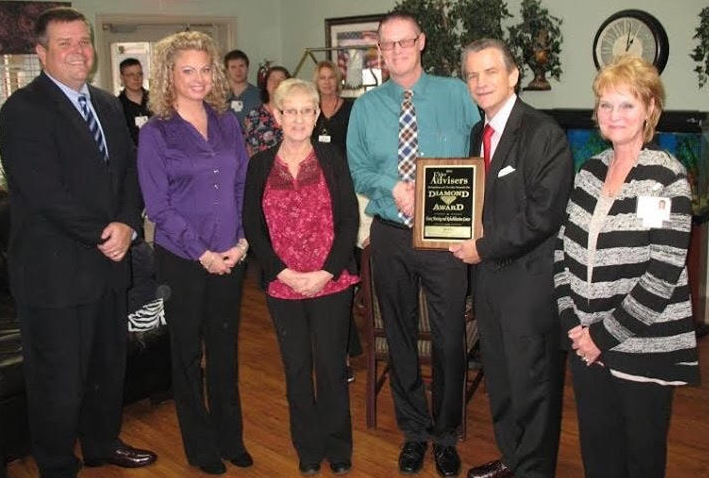 On January 15, 2016, Elder Advisers presented Green Valley Care Center with the 2015 Diamond Award for Excellent Service. Green Valley staff was recognized for its dedication, compassion and level of care provided to patients. 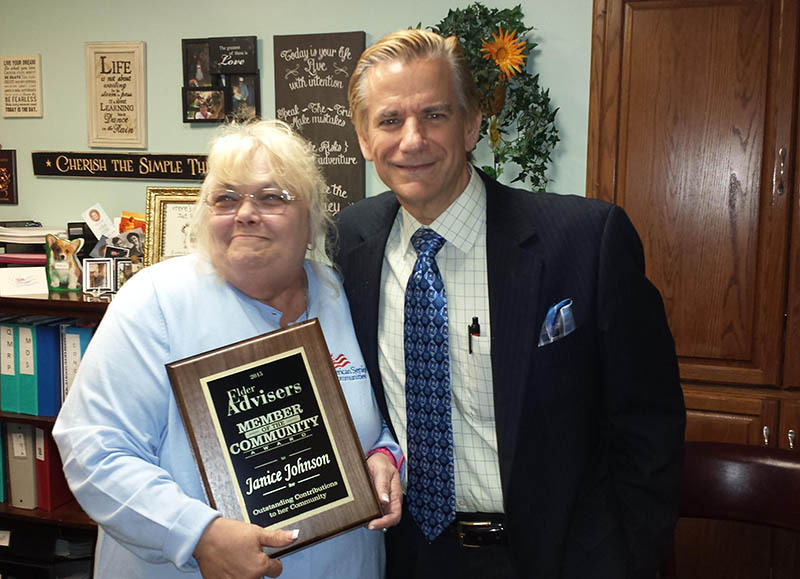 Elder Advisers’ Larry Weiss was on hand to present Seymour Crossing Social Services Director Janice Johnson with the 2015 Member of the Community Award. Janice is a long time employee who is dedicated to and passionate about the residents and families she serves. 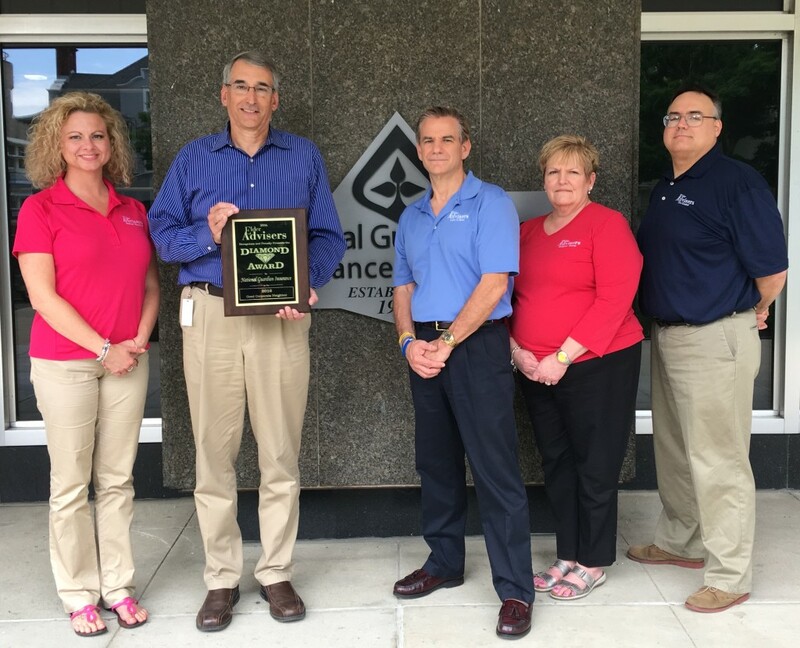 Larry Weiss, president of Elder Advisers, and his personal assistant Denise Manecke toured the National Guardian Life (NGL) Insurance’s home office in Madison, Wis., to meet with and thank staff members who help in issuing policies. Elder Advisers® utilizes NGL and the various policies they offer to help families with preplanning and in Medicaid situations. 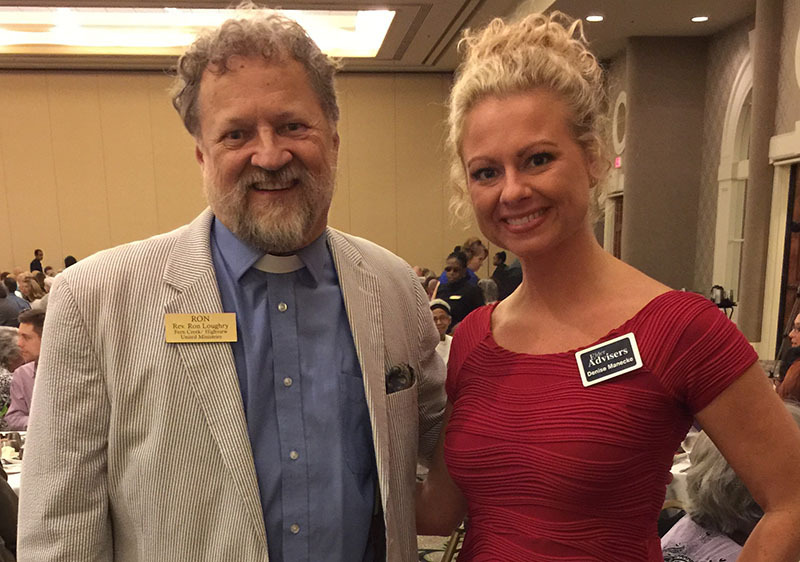 The Reverend Ron Loughry, executive director of the Fern Creek/Highview Ministries, was recognized as the 2015 recipient of the Champion of the Aging Award. 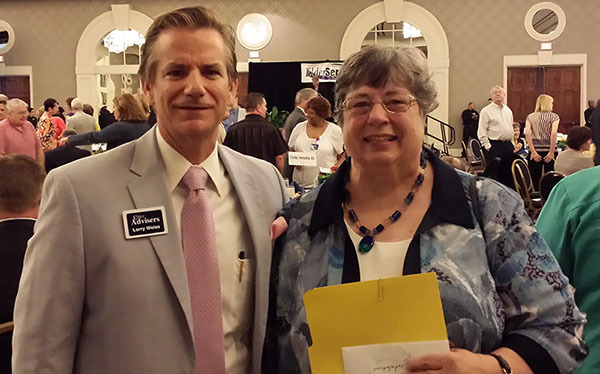 Larry Weiss, president of Elder Advisers, sent his personal assistant Denise Manecke to pass on his congratulations. The event was sponsored by ElderServe. 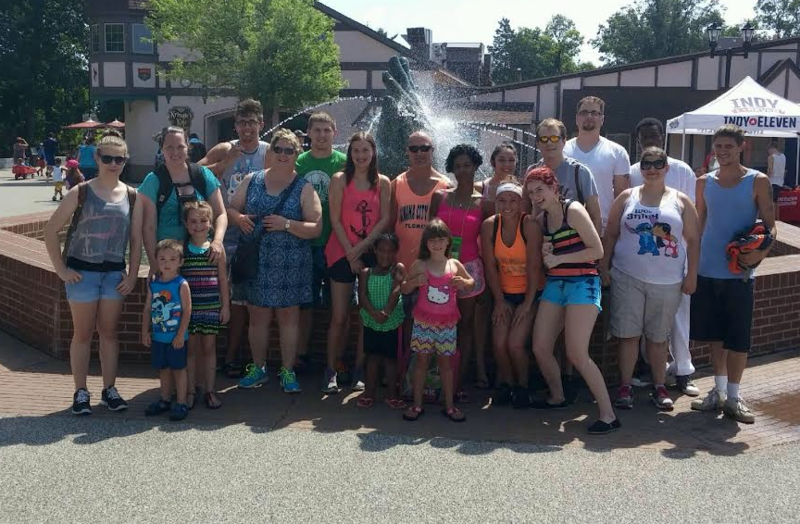 Employees of the New Albany-Floyd County Animal Control and Shelter and their families were treated to a trip to Holiday World, courtesy of Elder Advisers, on Monday, July 13. This was the third year that Larry Weiss, Elder Advisers president and long-time animal shelter supporter/volunteer, treated the staff to the outing in appreciation of their hard work throughout the year. Larry G Weiss, President of Elder Advisers congratulated Cindy Venable, director of Louisville Metro Office for Aging and Disabled Citizens, for being recognized as the 2014 recipient of the Champion of the Aging Award. The event was sponsored by ElderServe. 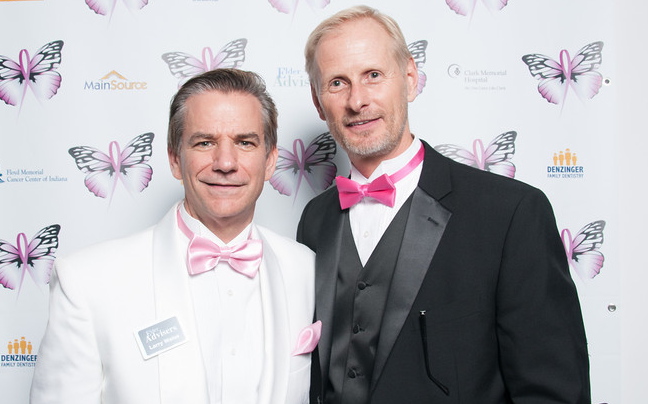 Larry G Weiss, President of Elder Advisers is pictured with Bill Hanson, publisher of the News and Tribune, right, at the inaugural Power of Pink Gala, which was held on Oct. 25, 2013. Elder Advisers was the event’s Platinum Host, and more than $20,000 was raised for the American Cancer Society and breast cancer research. 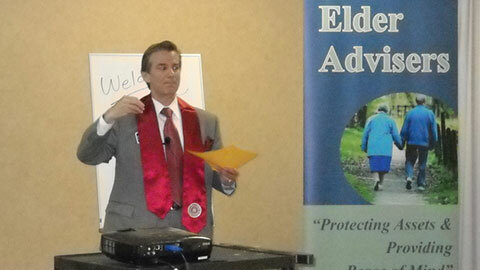 Larry G Weiss, President of Elder Advisers recently attended a Medicaid annuity conference sponsored in New Orleans. The workshop was sponsored by Krause Financial Services and focused on changes in the Medicaid system. 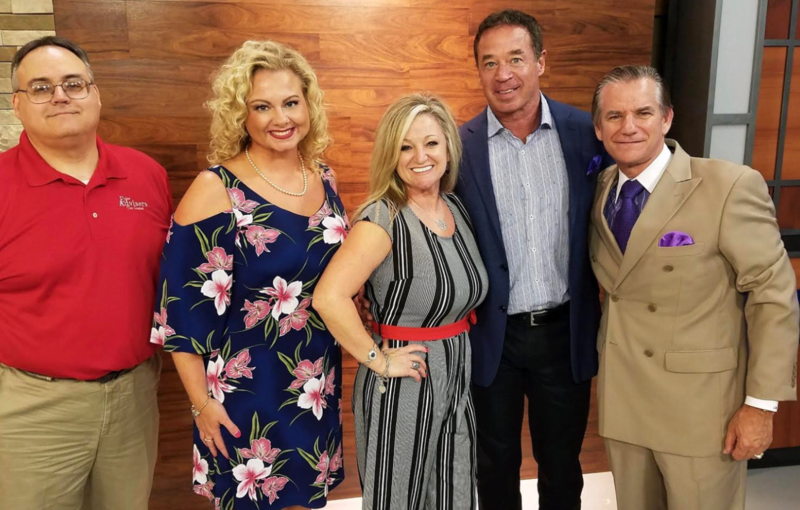 Pictured with Weiss (second from the right in red shirt) are Dale Krause, president and CEO of Krause Financial Services, Kendra Bishop, sale and marketing director, and Cassandra Bishop, event coordinator. 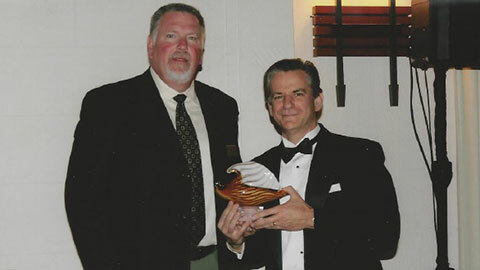 Larry Weiss of Elder Advisers, left, presented Dr. Marshall King, veterinarian, with Elder Advisers’ first ever Member of the Community Award. 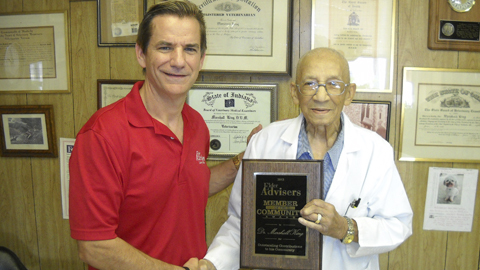 Dr. King has practiced in the New Albany area since 1954. 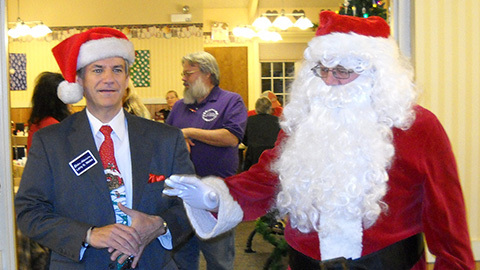 His office is located on Beechwood Ave.
Larry Weiss, President of Elder Advisers, sponsored a holiday meal for the staff of the New Albany-Floyd County Animal Shelter. 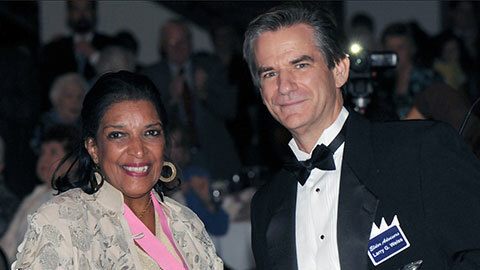 Weiss is a long-time supporter of the Animal Shelter, and this was the second year for the holiday dinner. 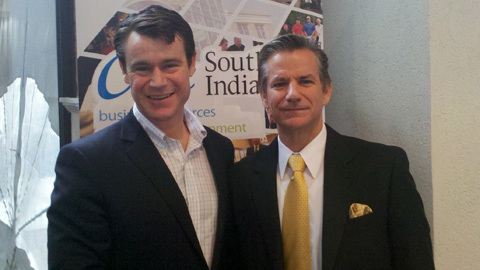 Larry Weiss, President of Elder Advisers, with Congressman Young at a One Southern Indiana luncheon event. Larry Weiss, of Elder Advisers, outside the corporate headquarters of National Guardian Life Insurance Co., in Madison, Wisconsin. 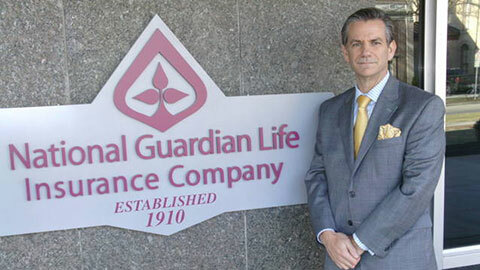 Mr. Weiss attended NGL’s annual meeting in March 2012. Right, Larry Weiss, of Elder Advisers, proudly wears a Stole of Gratitude presented to him from an IU Southeast 2012 graduate, Thomas D. House. The Stole of Gratitude is presented to someone who provided extraordinary support or who has helped the graduate with wisdom, words of encouragement or financial assistance. 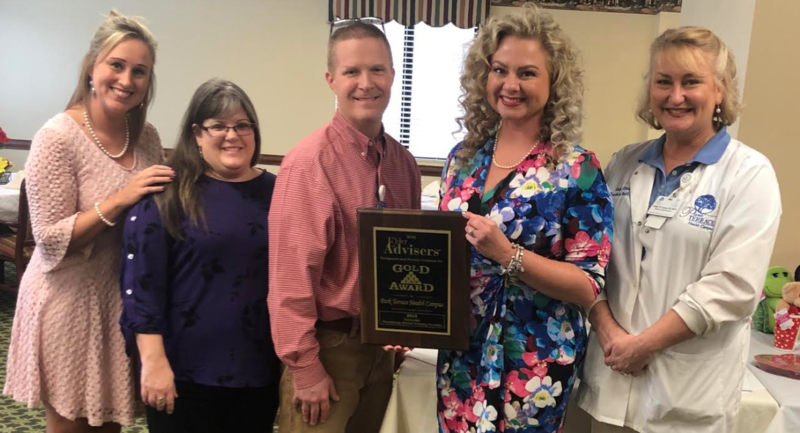 Larry Weiss of Elder Advisers, Inc., presented Yvonne Grundy with the One Southern Indiana Southern Indiana Woman of the Year award. Weiss and Elder Advisers were event sponsors. 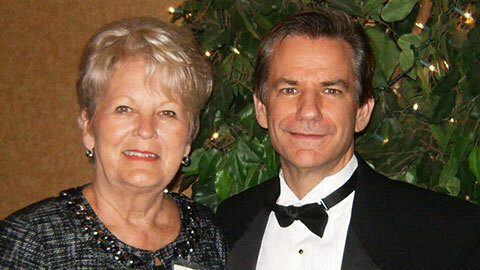 Larry Weiss of Elder Advisers, Inc., with Ann Shoop, National Director for National Guardian Insurance, at Spring 2011 Meeting. 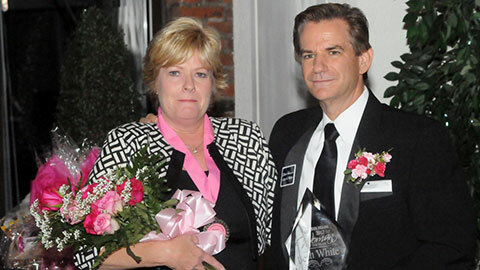 Larry Weiss of Elder Advisers, Inc., presented Beth White with the One Southern Indiana’s 2012 Southern Indiana Woman of the Year award. 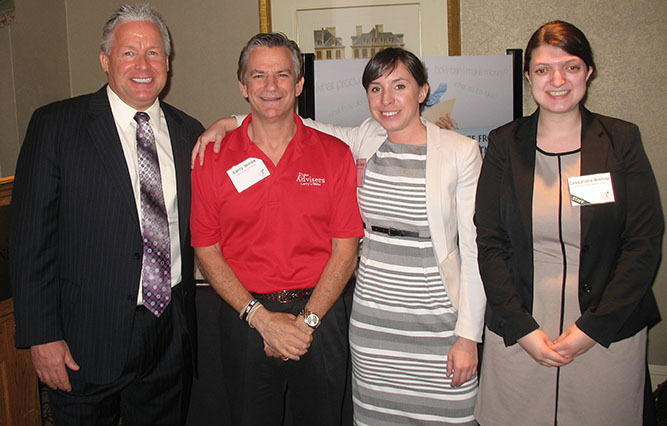 Weiss and Elder Advisers were event sponsors.